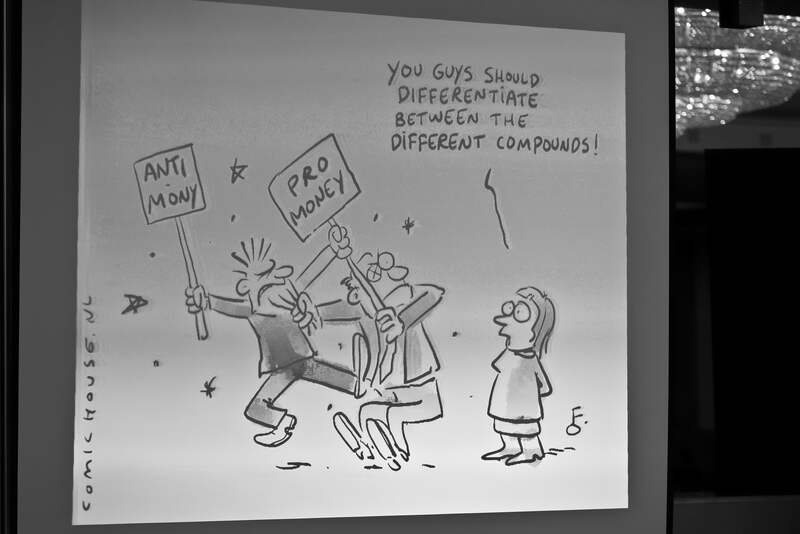 Moderating a conference about the possible reclassification of a chemical compound as carcinogenic is no laughing matter. The revaluation of antimony, a substance found in many household and manufacturing products, would have severe repercussions for those involved in its trade and manufacture. However, as you can see from the photos, we did raise a few laughs during the day. How? 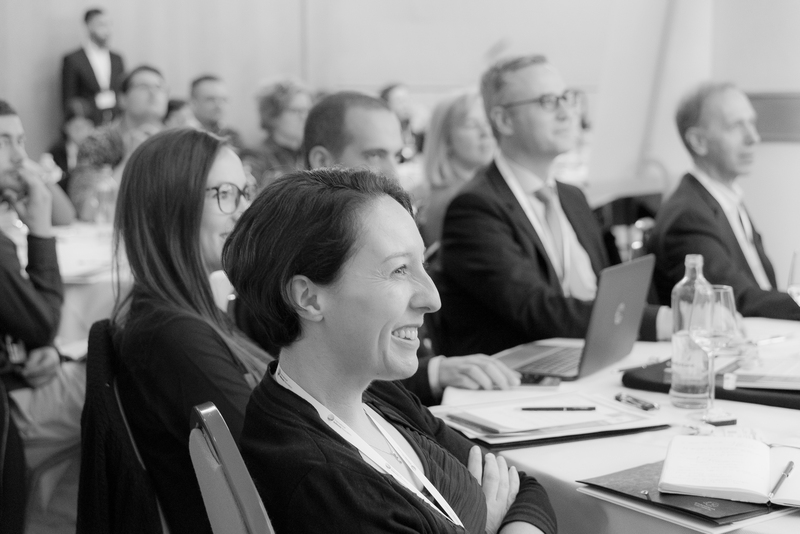 We made the conference as interactive as possible – quizzes, panel discussions, group brainstorming and feedback sessions. As a former TV and radio producer, I know that you have to keep on changing the pace and content of a programme to keep the audience engaged. But our secret ingredient was to use a cartoonist to make everyone laugh. Floris Oudshoorn is a gem. A Dutch cartoonist, who is fluent in English, he recapped the main points with some of his very witty digital sketches. The trick was to know when to bring Floris into the discussion. 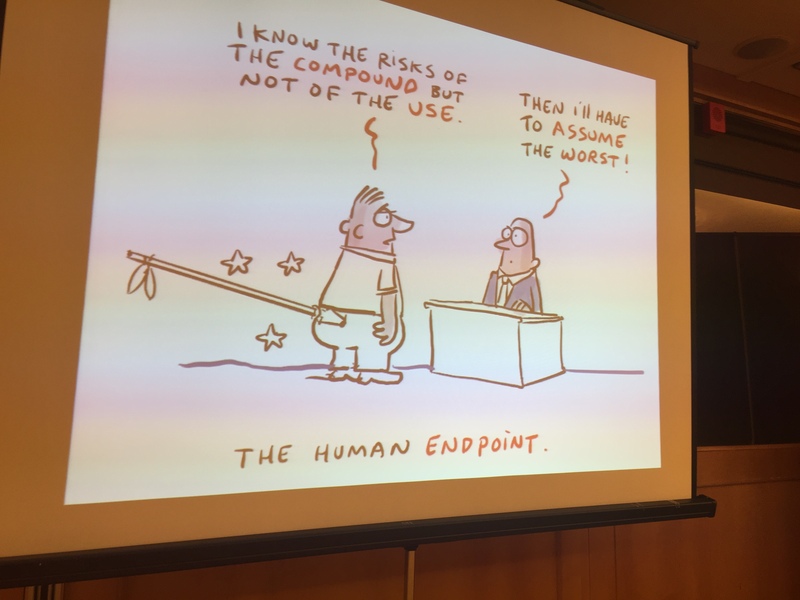 I had seen cartoonists work as a speaker presents, but this is often distracting as our eyes are always drawn to the visual. 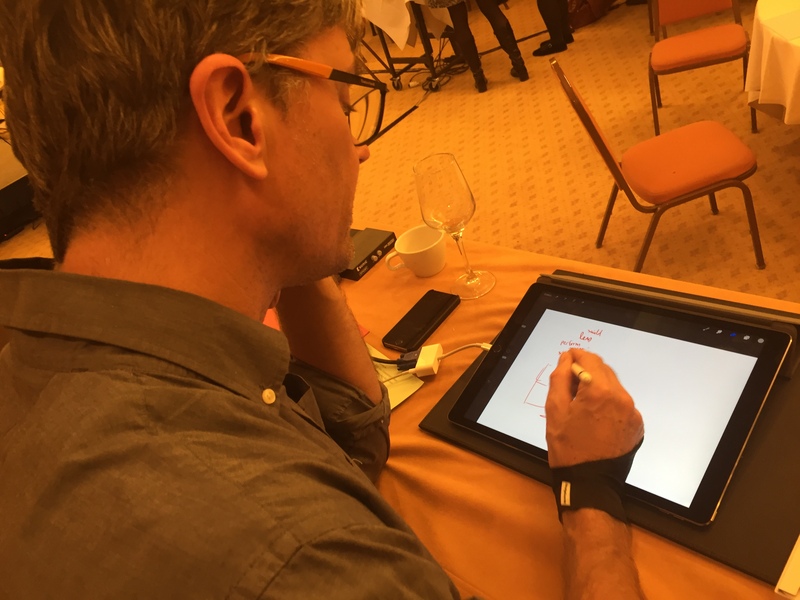 I had also worked with a graphic facilitator, who showed her work at the end of the event. This time though, Floris was an integral part of the day. He sat unobtrusively in the room, beavering away on his computer as the discussion unfolded. At certain pre-agreed moments, I would give him the floor to show us what he had been up to. His skill was not only to synthesise and visualise technical discussions but to make us chuckle. A picture is worth a thousand words so I rarely had to ask him to explain his ideas. They were self-explanatory. At the end of the day, he even drew a cartoon as we watched to see what emerged on the screen. Have a look at this short video I made of him at work. 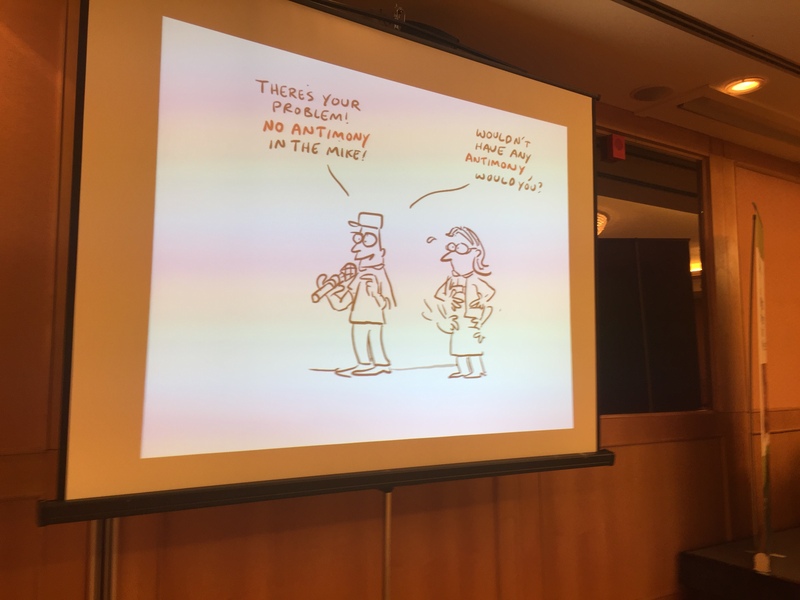 Floris must have created at least 30 cartoons during the day – many of which the organisers of the conference – the International Antimony Association – posted on their website. I am sure they will reuse them at every opportunity. 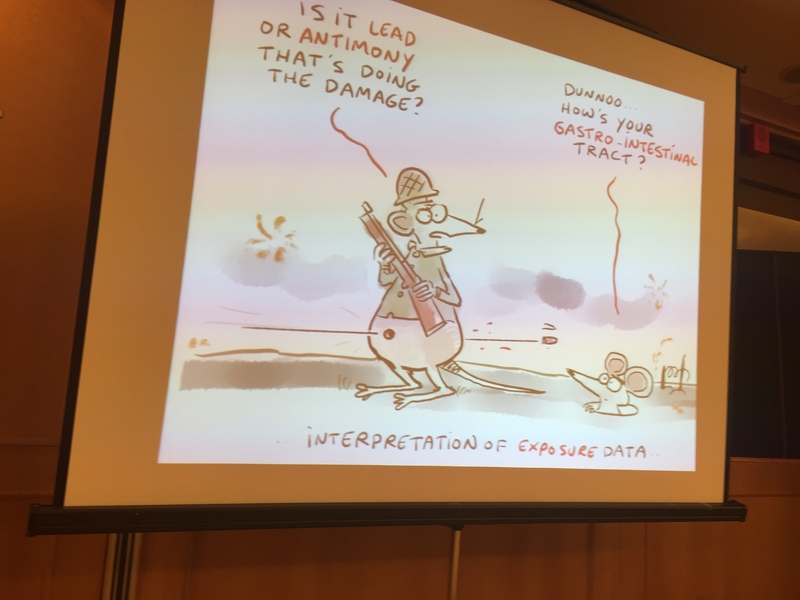 So if you are organising a conference even on a serious technical subject, think out of the box or in this case onto the screen and see if including a cartoonist may make your event even more memorable.